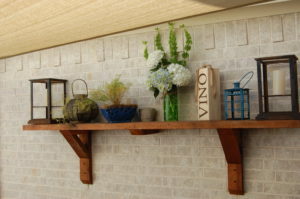 Patio shelves are a great way to make your patio feel more like an outdoor room. I had the perfect blank wall above my grill. I opted for a single 8 foot long shelf, that houses mostly decor and a few plants. You could make it more useful with hooks and storage for the grill equipment, or space for whatever you need like extra snacks and beverages. I like to change it up once in a while, so I have a Texas version, which is great for summer time. This shelf is easily transformed into an outdoor Christmas mantle or a balloon filled birthday scape – whatever the occasion calls for! This project was super easy and very affordable. Total time spent was around two hours with additional time for drying of stain/sealer – a perfect weekend project. Basic Steps: Design shelf and consider your supports, here we have used supports in the shape of a triangle, with a longer back. Then we added one 10 inch support board on the underneath of the shelf for additional support. We waited to connect the shelf to the supports until after we had hung the supports – it was much easier that way. 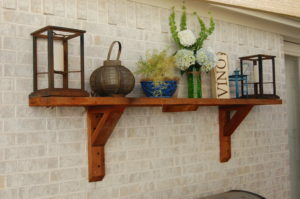 Also, remember to stain/seal your shelf before you attach – it’s hard to get that off your siding or brick! 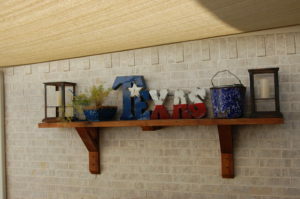 Quick affordable weekend project that will turn your patio into an outdoor room you will want to spend time in!